As of 1/11/10 The SpringHouse unit has been discontinued by the manufacturer; however, we will continue to sell the replacement parts for the SpringHouse. We will also continue to search for new suppliers, and better prices for the Springhouse parts. We need your Springhouse Serial number to order certain parts for your unit. Please use the contact us form below to send us the serial Number, or put it on your PayPal payment. We are offering a New Line of Whole House Water Purifiers, look on the Nav Bar to the left of this page. 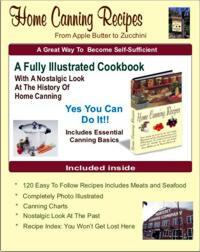 The average life of a canister for the Springhouse is approximately 4 to 5 years. If you have a Springhouse unit with a serial number WHUV2 101577 and below, we cannot get replacement canisters for that unit. However, if you order the new single O-ring canister it has a new head which can be installed into your Springhouse unit. 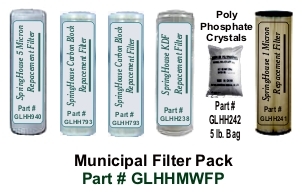 All filter-packs now have the Poly-phosphate crystals included. A filter pack for the Springhouse Municipal system. Contains 1 Each: 5-micron filter(or 10 micron depending on availability), carbon block filter, carbon block filter, Maz Filter, 1-Micron filter, 1 5lb bag poly-phosphate crystals. A filter pack for the Springhouse Well Water system. 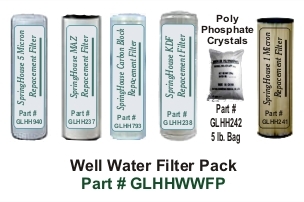 Contains 1 Each: 5-micron filter(or 10 micron depending on availability), carbon block filter, Maz Filter, KDF Filter, 1-Micron filter, and 1 5lb bag poly-phosphate crystals. We have both ballast assemblies, with a 6 prong plug and a 4 prong plug for our customers. Note** When installing the new ballast it is extremely important that you ensure that the Springhouse unit is grounded. Ballast assembly has a 30 day warranty from date of purchase, for MANUFACTURE DEFECT ONLY. A serial number is required to determine the correct ballast, returns will not be accepted due to purchase of incorrect ballast assembly. Click Here to purchase replacement parts only.